According to the just-released Sotheby’s International Realty® Luxury Lifestyle Report, if the top wishes of wealthy Americans could be expressed in a single dream home, it would be a “lifestyle property” on the waterfront with a multicar collector’s garage, which they designed themselves. Wealthy Brits particularly value homes with historic significance. Chinese wish for space to display their art collections and Brazilians harbor a desire for a “smart” home, the Sotheby’s International Realty Affiliates LLC research found. The survey, which focused on the purchasing behavior of high net-worth consumers, determined that buyers in each country made similar decisions based on lifestyle, family needs and return on investment. A search of the Sotheby’s International Realty inventory identified homes that meet many of the criteria expressed in the survey, which should reassure high-net-worth buyers that if they can afford such a house, they can turn their dreams into reality. Examples include a Destin, FL, waterfront home with three-car garage and space to display art, a first floor apartment in England overlooking the River Thames that was built in 1894, and a smart home in The Retreat along Scenic Highway 30A. 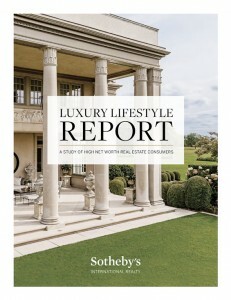 The “Sotheby’s International Realty Luxury Lifestyle Report” surveyed affluent consumers in the United States, United Kingdom, Brazil and China and found that the majority in all four countries are more likely to purchase a lifestyle property now than they were five years ago and to make a lifestyle property their primary residence. A waterfront property was the top choice for what they would consider purchasing next. A concurrent study of lifestyle search activity on sothebysrealty.com shows “waterfront” was the top lifestyle search on the website in 2013 at 42 percent. The majority of affluent consumers in the United States, United Kingdom, Brazil and China also were likely to make a legacy home purchase, which is a property intended to remain in the family or be gifted to children, with the highest percentages in China (93 percent) and Brazil (92 percent). A survey of Sotheby’s International Realty network members revealed that more than half of respondents say their clients spend between $1 and $3 million for a legacy home. In addition, the “Sotheby’s International Realty Luxury Lifestyle Report” showed that earning a return on investment was a key driver for clients when purchasing a property. Compared with five years ago, a majority of affluent consumers are more confident in the strength of the housing market in their country of primary residence, which they believe offers the best real estate value right now. This research confirms the important role lifestyle plays in the purchase of a home. We understand the unique attributes and lifestyles offered by the 30A and Destin markets and are well-positioned to showcase our clients’ properties to a global audience of consumers.